Some years ago, for some reason which seemed logical at the time, I got rid of my record player and quite a few of my vinyl records. Thankfully I kept a fair number. Last week, I got around to buying another record deck, dusting off the vinyls and re-discovering my old music. I lived in Ireland for several years, in Dublin. My parents are Irish. I’ve loved Irish music since I was in my teens. One of the vinyls I’ve played several times this week is “Promenade” by Kevin Burke and Mícheál Ó Domhnaill. I’d forgotten, of course, what a great album it is. It was made in 1978. They were young men, but at the peak of their creative powers. Masterful musicians. There are several standout tracks on the album, but the one which always ‘gets to me’ is “Lord Franklin”. It is a traditional song, which surmises the dream which Lady Franklin may have had when her husband went missing, searching for the North West Passage. 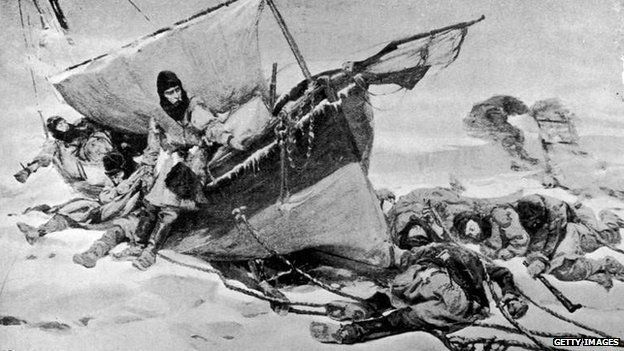 Franklin and 129 men on his two ships, Erebus and Terror were apparently stranded for three years in the frozen north, and all eventually perished in 1847. Going onto the internet, and looking for the later achievements of Mícheál Ó Domhnaill, I was then shocked to find that he had died in 2006 from a fall at his home, at the age of 54. I was deeply saddened by this – not that I ever met him, or saw him perform live, but that song has been part of me for many years; part of my youth I suppose. Further browsing then told me that one of Franklin’s ships had been discovered only last year, around Queen Maud Gulf. “I am delighted to announce that this year’s Victoria Strait expedition has solved one of Canada’s greatest mysteries, with the discovery of one of the two ships belonging to the Franklin Expedition,” said Canadian Prime Minister Stephen Harper. The location fits in exactly with Inuit stories at the time of Franklin’s disappearance, which were discounted as the worthless ramblings of savages by the authorities of the day. I’ve written several political poems in the few years I’ve been writing poetry. Some have been about specific political players, others about social issues. I think I can say that every poem I’ve written about a politician has been followed by their eventual demise. I’d like to take some credit for the departure of Thatcher, Howard, Abbott, Wilson Tuckey; less keen to think I had any part in the self-destruction of Rudd and Gillard. 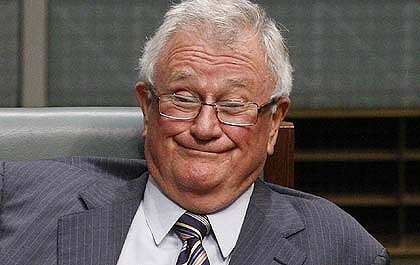 The life of a political leader in Australia can be short and sharp these days. Before writing poetry, I had written song lyrics for the South Australian Trade Union Choir. One was “Yes, we have no Osamas” – it took a few years before Bin Laden eventually left the scene. I wrote one about the Hindmarsh Island Bridge affair and one about working conditions (around the time of the ill-fated so-called “Workchoices” policy). and that’s why, Wilson Tuckey, I really, really, really love you man. Tuckey lost his seat in 2010. How do you take your tea Mr. Pinochet? Please stay for dinner? We have a buffet. With all sorts of meats, spare ribs and jugged hare. When you burn a dead body, is the flesh very rare? Thatcher died a few months later. left him there spreadeagled, naked. the way a man dying of shame might issue a last mournful howl. Just a few weeks ago, Abbott was deposed by his own party. These poems are now past their use-by date. I was delighted that I had a chance to give the Abbott poem one final outing just a few weeks ago as guest poet at the Friendly Street Halifax Cafe gig. It will now be consigned to history, like its subject (though he shows signs of not going quietly). Can I claim any part in the demise of my subjects? Well I will anyway, even if it’s just for making one or two people think about the subject of the poem. So, if you are going to write a political poem, air it as often as possible while the topic is still relevant. They are very perishable commodities.